occupational hazard for so many. Maness looked for a graduate program that would allow him to pursue his passion for materials development, when his undergraduate professor, Bryan Ormond, told him about the Textile Protection and Comfort Center. The lab is recognized for its mannequins and instrumentation used to test a variety of materials and ensembles used in firefighting. One high-profile mannequin is PyroMan, a life-sized human figure used to test ensemble flammability. As an undergraduate at NC State, Maness studied polymer and color chemistry in the Wilson College of Textiles. After graduating, he enrolled in the textile chemistry graduate program and began taking classes and working in Research Triangle Park the following semester. Maness briefly pursued research involving textile composites, but Ormond later invited him to participate in materials research in TPACC. “I actually didn’t start with the ambition to come to TPACC. When I first started grad school, I had a full-time night shift job as a quality-control chemist. I tried to orchestrate a research program with (my employer), but it didn’t pan out,” Maness said. 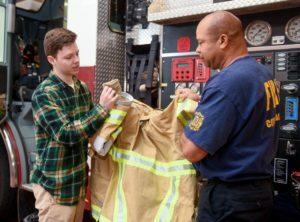 Since entering the program, he’s been working to improve firefighters’ gear—called a turnout—hoping to reduce the particulate material from fires that gets into the turnout and may contribute to higher incidents of cancer. The flash hood, which covers the firefighter’s head and neck, is of particular interest since skin around the jawline and neck is thinner and more vulnerable to toxins. While a firefighter’s breathing apparatus can help minimize inhalation of these substances, the personal protective equipment worn by firefighters—including the hood—aims to protect them from dermal exposure to the particulate matter generated by fires. Maness and his team are seeking materials that would minimize firefighters’ exposure to toxins, such as asbestos, benzene, styrene, heavy metals, chlorinated hydrocarbons, and polycyclic aromatic hydrocarbons, many of which are carcinogenic. Given that Maness’s role in the overall project involves materials research and evaluation, he developed lab equipment to help evaluate the effectiveness of different materials and designs. One piece of equipment is a small wind tunnel designed to test different types of material for particulate permeability. 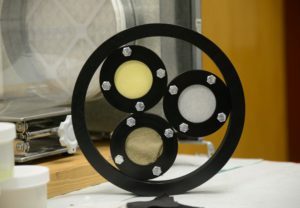 Fabric samples are inserted into a chamber, where aerosolized fluorescent microspheres are blown at them to see how much fluorescence penetrates through. Two mannequins also test how easily smoke can penetrate firefighters’ gear. Maness pumps smoke into the mannequins, and it comes out through the firefighters’ gear so that researchers can observe where the smoke comes out, identifying potential weak points in the ensemble design. A torso and head mannequin is designed to evaluate materials for the flash hoods that protect firefighters’ heads. When smoke is pumped into the mannequin, researchers observe the hood in a dark room with bright lights shining on it to characterize the particulate-resistant capabilities of various test materials. The more the smoke leaks from the flash hood in the test, the more particulate matter can get in during a fire. The second mannequin, a complete body, tests the entire turnout to determine where smoke escapes. Here the researchers are looking at the turnout design, and often, they discover that smoke drifts out around the waist, wrists, and ankles—places where particulates are likely to get in during a fire. Maness was recently recognized for his work by the American Association of Textile Chemists and Colorists. At the association’s international meeting, he took first prize in the Herman and Myrtle Goldstein Paper Competition for writing and presenting on his research involving these mannequins. In seeking the most protective materials and designs, researchers must also be aware of the need to balance protection against functionality—how easily firefighters can maneuver in the turnout, as well as their physical and thermal comfort. To get an expert opinion on various materials and styles, Maness and his colleagues visited local fire and emergency management stations to talk with the firefighters themselves. In the lab, these researchers are looking for materials that are light, breathable, heat-resistant, durable and maneuverable. One recent afternoon, Maness visited Raleigh Fire Station 8 not far from campus, along with Ormond and research associate Cassandra Kwon. He brought several turnouts to Raleigh firefighter Corey McGee, who has tried them in the past. McGee was impressed with some of the changes that Maness and the project team had made to the turnouts. He liked the fact that the design was less bulky around the waist than earlier models. He also tested the pants to see how easily they could be staged with his firefighter boots—so that he could quickly put on the boots and pants in the event of a fire. One thing that has surprised Maness was learning how many firefighters are unaware of the health risks that come with their profession. Learning about the risks makes them all the more grateful for the work done by the TPACC. The exposure to these toxins is “what we could call a ‘long-term silent killer,’” he said. “My main concern right now is just the overall well-being of firefighters, after reading and doing research for my thesis. The rates of cancer, as well as other maladies like lung problems and heart problems, are much higher for firefighters than the rates in average civilians,” Maness said. Learn more about graduate degrees in textiles. I have been with the city for 30 years and I’m presently being treated for melanoma cancer and basil on and around my neck shoulder area and neck jaw bone area. Anything that you can do to help other would be a step forward. Thanks for you work and research. It will help to make our job safer. As new products are developed every day that we don’t understand the long term effects. The more we need better protection. Thanks for looking after us.